Posted by Blue on Aug 28, 2014 in News | Comments Off on Support Ferguson Businesses! Home » News » Support Ferguson Businesses! Blue’s ArtHouse is helping to promote healing and raise funds for Ferguson businesses that have been hurt by recent looting in the aftermath of the recent Ferguson tragedy. 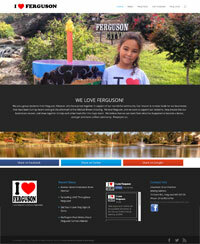 The I Love Ferguson Committee is a group residents from Ferguson, Missouri, who have joined together in support of our wonderful community. We love Ferguson, and we want to support our residents, help ensure that our businesses recover, and draw together to help each other heal after this tragic event. Please help us support the hard-working business owners and employees in Ferguson and surrounding communities!